Enjoy meals on your ground-floor lanai, surrounded by tropical palms and foliage. This beautiful condo is just steps to the pool! This large 2 bedroom, 1 bath ground-floor townhome is beautifully decorated in Hawaiian style decor. There are Queen beds in both bedrooms, a Queen size sofa sleeper and one full bath. With 850 square feet of living space, guests also enjoy the additional square footage provided by the large lanai. The lanai overlooks Koa Resort's immaculate gardens, including a nearby fragrant plumeria! Remodeled in 2012, this has a new kitchen, new carpet in the bedrooms and living room, and a spacious lanai that opens up to the beautifully manicured Koa Resort lawns. Koa Resort has one of the LARGEST swimming pools in South Maui, which is great considering it is one of the "smallest" properties. If you look at the "Bird's Eye View" of this property, you'll see that Koa Resort's swimming pool is 2 - 3 times the size of the surrounding area's swimming pools. 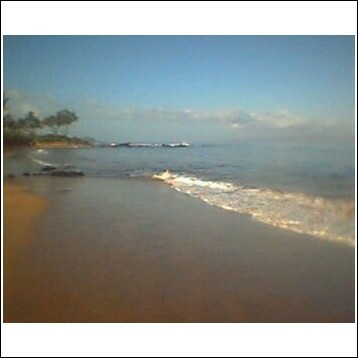 Koa Resort has just 5 low-rise buildings, with only 54 units, making this property a nice quiet, relaxing place to enjoy your Maui vacation. Traveling with a large group? Be sure to ask about our other units at Koa Resort. 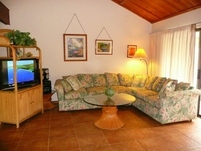 We can accommodate large groups at this property, which makes Koa Resort great for families and reunions. Enjoy meals on your lanai, which is surrounded by tropical palms and foliage, yet overlooks the grounds and enjoys fresh Island breezes from the Pacific!